This superb wine is the result of seven different Pinot lots blended together. Red ruby in color, this blend offers a pretty nose of cranberry, rhubarb, and cherry with hints of barrel toast and earth (that's from the Leras Family Vineyards). The inviting qualities found on the nose are mirrored on the palate. There's an elegant fusion of tart red fruit - cherry, pomegranate and rhubarb - with hints of earthy minerality, fine-grained tannins and gentle oak notes. Bright with frisky acidity, it begs for food. A nice piece of fatty salmon, duck or pork tenderloin with fall vegetables sounds mouthwatering and delicious. 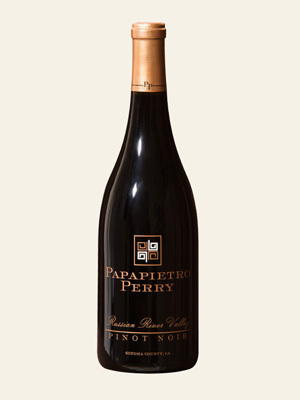 Our Russian River Valley Pinot Noir is a blend from carefully selected vineyards from this appellation. We include these vineyards— Leras Family, Nunes, Bucher, and Vin Noy as well as others that we may want to try. We add new vineyards to this blend to see if they’ll fit our flavor profile and become a vineyard designate in future vintages. Each vineyard holds its own distinction; and we feel that the fruit is among the best the Russian River Valley has to offer.